The ARCPANEL Custom Panel combines a COLORBOND® Corrugated profile roof sheet with a COLORBOND® corrugated profile ceiling sheet bonded either side of varying thickness of a polystyrene (EPS) core. The ARCPANEL Custom Roof Panel is ideal for use in residential applications; multi-residential; commercial office and retail buildings as well as for health and aged care; education; community; sports and recreation; entertainment; defence accommodation; social housing; train stations and infrastructure. The ARCPANEL Custom Roof Panel is a fully customised and complete roofing solution that is quick to install with superior span and cantilever capabilities. 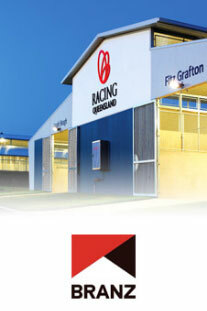 ARCPANEL pre-fabrication starts with standard Corrugated COLORBOND® sheeting, bonded to both sides of profiled EPS. The panel yields high strength resulting in large spans and cantilevers along with a high insulation value. Standard ratings from R1.7 to R6.5 can easily be achieved. The strength of this construction means that the ARCPANEL Custom roof panel is suitable for use in cyclonic conditions. After the panels are fixed in place, there is virtually no maintenance required other than the occasional wash down of soffits.